Free vs. Paid: This free site will always remain free. The paid version, The Sethi Investments Advisory Newsletter, has been in a private, limited distribution with a frozen membership since 2007. On a semi-annual basis, its extension into a wider, public distribution is re-evaluated. We keep a list of those interested in being added to the membership and, when it opens up, will be adding members in chronological order from that list until the limit is reached. Nota Bene: Thank you for all the inquiries via email/form below. Unfortunately, the sheer volume of email makes it impossible for us to respond to each of them in a timely manner. Please allow us a few weeks to catch up with the email as there's an immense backlog of inquiries and requests after the mention of our plotter calling the market bottom. Please enter a valid stock symbol and click "Get Chart Now!" to get its chart (click here to try the Java version). Click here to see the original, out-dated (but absolutely free for unlimited uses) version: old, basic Sethi Family's Darvas Box Plotter. This applet requires the latest version of Java. If you don't already have it, please click over to Sun's Official Java Download Page in order to get the latest (FREE) software. Usage: Using the applet should be relatively straightforward. Boxes that are completed but that haven't had a breakout yet are displayed in Yellow. It might take several seconds for the chart to show up... please be patient if it doesn't come up immediately (but it shouldn't take longer than about 10-30secs, depending on your connection). Note: If the symbol doesn't have any data or the server cannot handle the request, your Java Applet/Browser may freeze for up to 30-60secs. Different browsers will freeze for different amounts of time but it should never take longer than that range under normal circumstances. Each chart you open will stay open until you explicitly close it. You may open multiple charts but please be aware that you have to close each window yourself. Please send any suggestions, bugs, or comments you might have to darvas at sethi.org. We'll review each comment personally and, if appropriate, respond asap. The original, out-dated old, basic Sethi Family's Darvas Box Plotter will always remain up (and remain free... heck, we won't even require registration! :). The Sethi Extended Darvas Box Plotter (including the application, applet, and non-Java/regular HTML versions), however, will be part of the Sethi Investments Advisory Newsletter, which will also include the results of the stock scanner derived from these applications, either on a subscription or purchase basis. However, a careful reading of his classic tome can lead to wildly differing interpretations on how to best implement his system. I'm not sure if Nicholas was purposefully ambiguous in detailing the exact method of computation but the end result has been nothing but confusion. And so it comes as no surprise that our little Sethi Darvas Box plotter has gone through many iterations. In its current incarnation, I've made it as close to Darvas' original method as I could. Which isn't to say this is the canonical Darvas plotter; just my best guess on exactly how the Darvas boxes should be constructed. That being said, what my program does is always look for a top first. Once a top is firmly in place (currently, a three-day period), only then does it look for a low. The only other note is that a breakout can occur to the upside or the downside. In either case, we always look for a new top first, and then the subsequent low. In previous iterations, I did draw the boxes in dramatically different fashions. But, after a careful re-reading of Darvas' account, I thought I should stick with his original directive in the public version, which states that you find the top, make sure the top doesn't get violated for three days (including that day), and then look for a bottom (this is the source of many discrepancies in different versions; e.g., if you achieve a new low within that three-day buffer period, you might expect the low to be lower). As you investigate the Darvas method further, I'm sure you'll find a variety of approaches. In its original incarnation, my program bowed to symmetry and would look for the bottom first on a downside breakout. In this version, however, I've setup the program to always find a top first and then look for a bottom. This version sticks to the original Darvas dictate (and thus ignores the promptings of symmetry) and always looks for the top of the box first (I suppose that might be called the "traditional" Darvas approach). That is, the program, as it's currently configured, always looks for the box top first, even if the breakout is to the downside. If that top is penetrated before the bottom was firmly established, it looks to establish a new top again (this seems to be what Darvas meant, at least according to my interpretation of the appendix). It's trivial to set it to find the bottom first; in fact, I used it like that much earlier. But I remembered commenting out those lines because they seemed to give better results and were more in line with the Darvas method. So , the program, as it's currently configured, always looks for the box top first and then searches for the bottom. About the periods: it currently uses a period of 3 days for both the top and the bottom. And it does, indeed, use the highs and lows (in an earlier version, I used the closing prices but upon re-reading Darvas' classic tome, I thought the highs and lows should be given their fair due). So, in summary: We store the top and then see if it remains unpenetrated for three days (including that day). If it does, then we look for a low, repeating this process in reverse (and wait for three days, including that day). If the top gets penetrated before the low is firmly established, we scrap the previous numbers and repeat the whole process from scratch. This will probably require a minimum of five days. Then, we wait for a bar to penetrate the high (a buy signal) or the low (a sell signal). The placement of the stop loss (and, actually, the decision to buy or sell) really varies from implementation to implementation. I believe Darvas' original interpretation was to only buy when there was a pattern of boxes stacking on top of each other and to place the stop loss at the top of the previous box. My program uses the low that's not penetrated for three days (after the top has definitively been formed and remains unpenetrated (the high of the box is always drawn first; the bottom is set only once the top has been formed (and remains unpenetrated throughout the establishment of the bottom)). In its strictest interpretation, I'd look for at least three boxes, with each subsequent box being higher than the one before and then place a buy order if it penetrates the latest box to the upside. In addition, I place the constraint that any penetration of the box is only to the upside (a penetration of the bottom, or to the downside, should automatically trigger a stop loss). In summary: my personal requirements are much stricter than Darvas' original method. I require the breakouts to be to the upside and require at least three stacked boxes with upside breakouts. 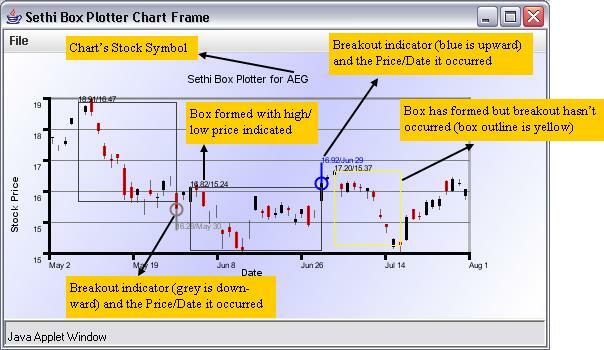 The sell signal would be whenever it broke through the bottom of the latest (or last) box.